After being introduced to our new fire safety simulator during the June 2015 Interschutz Expo in Hannover, Germany, Chief of the St-Jerôme Fire Department Daniel Hillman, encouraged 4 local Fire Departments to pool their resources and acquire a simulator of their own. The Hazard Apartment for Seniors simulator was specially designed for presentations to the elderly in senior homes. 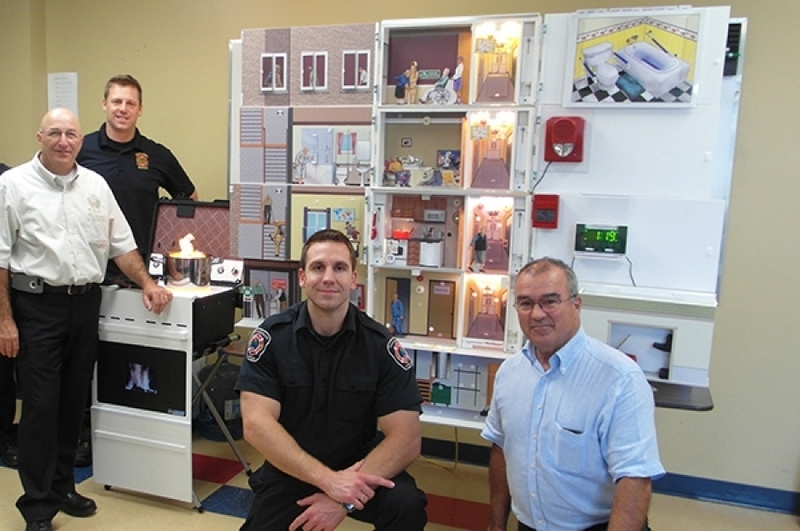 According to Modeltech trainer Jacques Lanthier, “the addition of the Hazard Kitchen module to the Hazard Apartment will be a key asset in teaching seniors how to react when a kitchen fire breaks out”. Following a request by Public Safety Officers from the cities of Mirabel and St-Jérôme, extra props such as a BBQ, a propane tank and flammable contents were added to the basement. In addition, new illustrations were prepared to highlight additional hazards. For example, while people may think it safe to put out cigarettes in the soil of flower beds, some are actually filled with peat moss, a highly flammable material. Also, new hazards linked to ethanol fireplaces will be presented.